Straight and smooth locks are all the rage these days. However, many salon treatments are harsh on your hair causing damage and split ends. Not to mention, those solutions are often pricey. However, what if we told you that you can get gorgeous straight hair without the cost or the harm? The truth is, several in-home treatments require ingredients that many of us have in our pantry. Don’t buy into the cure-all over-the-counter treatments. Most of those come with some pretty steep side effects. Instead, opt to try a natural approach that nourishes and straightens. Let’s take a peek at some tried and true natural solutions for straight hair. Coconut milk is not only linked to keeping your hair straight, but the antibacterial properties help reduce the likeliness of scalp infection. Search Home Remedy says that you should extract the juice from a coconut and allow it to set on your hair for ten minutes before rinsing. If you want to keep your hair straight make sure you are using beer. That’s right. Beer. According to Top 10 Home Remedies, beer is rich in vitamins and antioxidants that keep hair strong and sleek. You can use flat beer as a final rinse after shampooing. Aloe Vera has enzymes that promote healthy growth. Plus, the gel can hydrate your hair to keep it straight. Dry hair is much more likely to frizz. Home Remedy Shop indicates that you can make a condition for your hair by combining ½ cup (120 mL) warm oil and aloe gel. Wash off after thirty minutes and your hair will be straight. An article from Tree Hugger suggests using milk and honey to get straight locks. 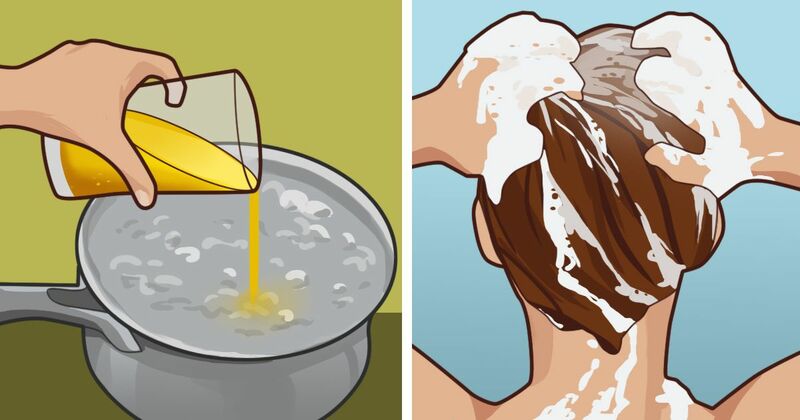 Mix one cup (240 mL) of milk with one tablespoon (15 mL) of honey and apply it to your hair. The vitamins from the milk coupled with the cleansing properties of honey help keep your hair straight and shiny. Castor oil can work to keep your hair straight because it hydrates from scalp to root. Coat your hair with castor oil, allow it to set on the hair for a few minutes before rinsing away. Be careful not to apply too much oil to the scalp because it will make your hair look greasy. Fuller’s Earth is a great option for taming your mane. It works to hydrate and repair damaged hair. Search Home Remedy indicates that you should mix one cup (240 mL) of fuller’s earth with five tablespoons (75 mL) of rice flower. Next, mix in an egg to make a paste. Allow to set on your hair for several minutes before removing. Bananas are rich in minerals that promote healthy hair. According to Home Remedy Shop, you should mash up two overripe bananas and create a mask for your hair. The end result will be moisturized hair that is straight and shiny. What a great way to use bananas that are too ripe! Top 10 Home Remedies indicates that celery can work as a natural straightener and stimulates hair growth. Soak the leaves in water and use it as a spray on your hair for desired results. Apple cider vinegar is beneficial for your hair because it restores the natural pH level and enhances the overall look and feel of your hair. When your hair is healthy, it is less likely to dry out and kink up. According to Top 10 Home Remedies, you should combine two tablespoons (20 mL) of apple cider vinegar with one cup (240 mL) and apply the mixture to your hair after shampooing. Leave it on your hair and allow it to air dry. Are you ready to straighten your hair? Try out some of these products to see which one works for you. Don’t forget to share with your friends!